A medium-sized duck, mainly orange-brown in colour with scaly pattern on back, large head, thin neck and long legs. Sexes alike. In flight, the large rounded wings look black below and distinct maroon patches are visible on the forewings and rump. Nests in treeholes, abandoned bird nests and reedbeds. A gregarious bird, frequently seen perching on open tree branches. Vegetation and reed covered jheels, village ponds. Range Resident, but moves locally; all India south of Himalaya. 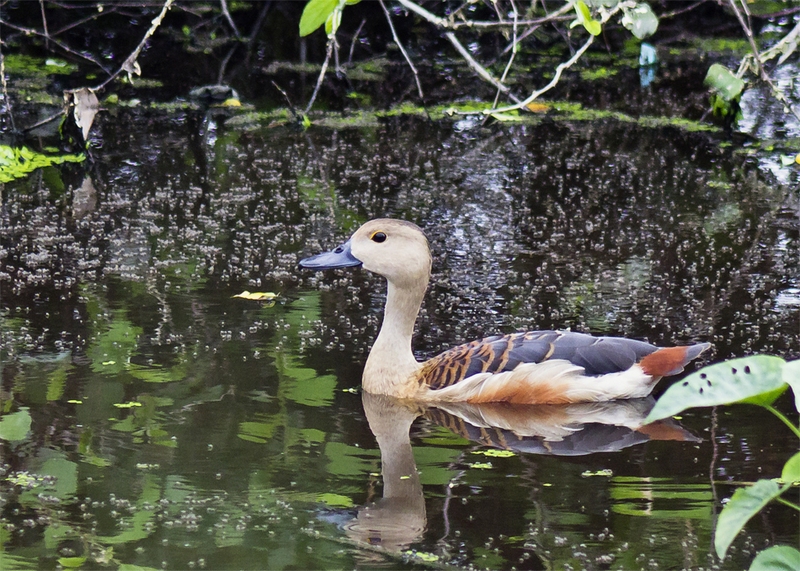 Although there are records for most months, the majority of Lesser Whistling-ducks are local breeding summer visitors to our area. They arrive during April and May and breed before the onset of the monsoon. Most move to further south in India in September and October. The species is only locally common and rarely in groups of more than 50 in our area. Were it not for its noisy, low flight it would often be overlooked as it favours well-vegetated wetlands, where it spends a lot of the day in thick cover. It avoids large stretches of open water and usually does not mix with other duck species. They are largely nocturnal feeders and fly out to suitable marshy areas, including wet rice paddy, in the evening. Although the species does nest in tree-holes or on the deserted stick nests of other birds (hence their alternative name of tree-duck), many also make the usual ground nest of most ducks. Broods of downy young are sometimes encountered but it seems that not all individuals that visit us breed. Shrill, musical whistle frequently in night.